The bolt in front of me gave a feeling of real steely solidity, security and safety, a human influence in a sea of vertical rock. The quickdraw gave a sound half way between a click and a clack as it went onto the hanger, the rope with a quick upwards pull and a deft flick of the wrist and thumb went into the carabineer, my breath wooshed out and my forehead leant against the rock, the skeletons of ancient minute sea creatures dead for millions of years. I examined the 12inches of rope between the crab and the figure of eight on my harness to dispell the wave of unnecessary panic sweeping over my mind. The other side of the draw the rope disappeared down to Choire some 80 vertical and slightly overhanging feet below me. I didn’t see him, I wasn’t looking, my faith and trust was implicit, I knew he was there watching me, I was only intent on what was above. 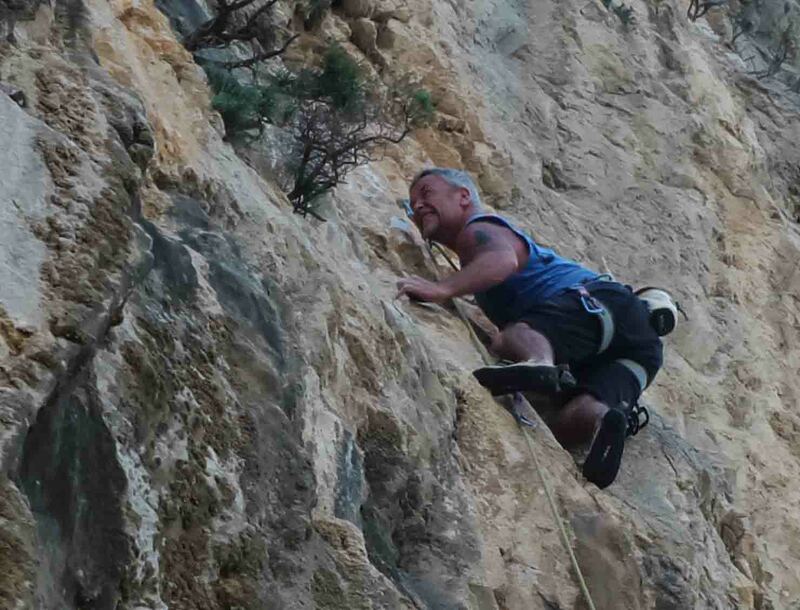 “38m of relentless wall climbing on small hidden holds” was the description in the guidebook. I looked above me to the next bolt some 2m above my head and about 1m to the left, the wall above looked awfully blank with the exception of a vertical fin of flowstone that looked like it was taken out of the spaceship in alien and stuck onto the rock at the same height as the next bolt. The red rock against my sweating forehead was rough and prickly; it smelt of the earth, dry and ancient, it was real, tangible. Above my head it bulged out in a perfect arc some 3inches deep and then continued devoid of any tangible features to the fin of flowstone. No time to hang about, the first 80ft of climbing had taken its toll, my fingers were sore and the lactic acid in my forearms was burning. It would have been so easy to shout “take” and have a rest on the rope, to give my mind the security of knowing that the rope and draw would hold me, to just stand there next to the protection for a while longer. I reached over the bulge and groping around with my left hand found a small three finger crimp, good enough to pull my feet up onto a three inch deep, 70 degree rough sloping ledge, the clipped bolt was now at my knees. I saw a good edge for my right foot at about thigh height, no hesitation, I swung my right foot up and pushing down now on my left handed crimp rocked onto my right foot whilst reaching up for anything for my right hand, bugger all, just little sharp edges all sloping towards me. The fin of flowstone above me looked like it might harbor a pocket at its bottom but it was still way out of reach, my left foot was floating, I looked down, there was nothing for it to go onto, I started to wobble and in desperation reversed the move back to the sloped ledge. 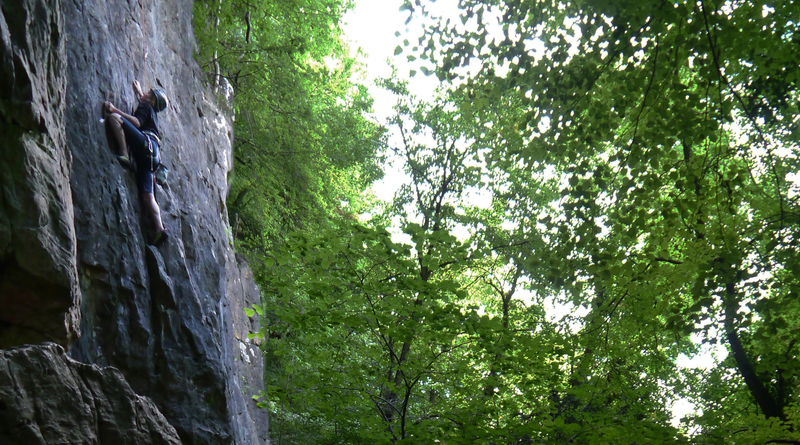 Choire on the 38m relentless wall climbing route. I examined the rock around me, just under the bulge there was a protrusion of rock about the size and shape of a large raisin, I had not been able to see it as it was under the bulge after I had moved up, it was right where I need something for my left foot. I pulled up again onto my right foot, jamming my thumb against one of the downward pointing edges I swung my left foot under the bulge and onto the little raisin of rock, gently, tenderly, lovingly I released the tension in my body and let the weight come onto my left foot, it held and allowed me to now release the pressure on the downwards crimp and reach further left where I eventually found the security of a three finger tip side pull. Putting all my weight onto the raisin I transferred my weight to the side pull, smeared my right foot on the rough rock above the bulge and reached for the hoped for pocket at the bottom of the flowstone fin. Crap, it was just a sloping ledge, it did not hold a hidden pocket, no way I could hold it, I could feel my fingers sliding down it already and the rock under my smear giving way. The world around me forgotten for the last few seconds, minutes? came back into focus as I heard Choire’s voice shouting breathe, breathe. I realized I had been holding my breath and allowing myself to tense up. I exhaled, relaxed, skipped my left foot off the raisin and slid my right foot onto it, swung my left foot out to a small edge and levered off the side pull, this gave me enough reach to pinch the flowstone fin. No way I could use it to pull up on but planting my right foot high on the blank rock I turned it into a layaway from which I could clip the next bolt. Click/Clack I reached past it and found a bomber pocket which I swung onto like a happy gibbon. 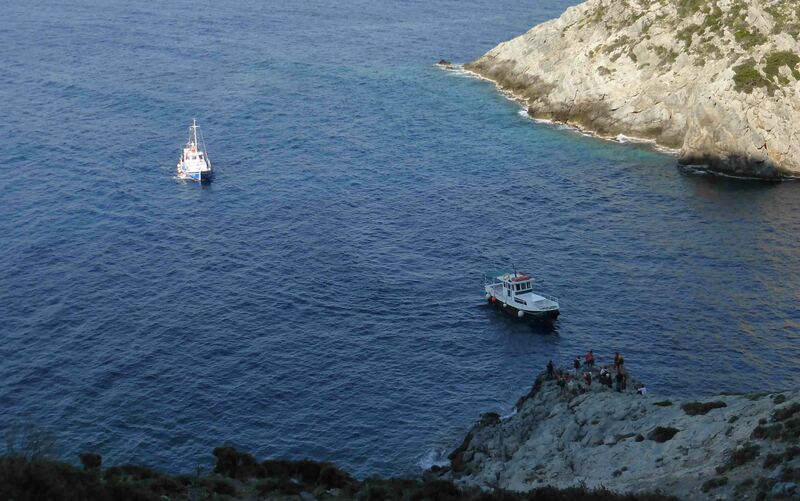 Only another 10m to go… this is what we had brought a 100m rope for, this is why we were in Kalymnos. The month of August is traditionally holiday time for us, the schools are all on holiday, we have finished our summer expeditions, the phone doesn’t ring ( thankfully ) and the sun shines in the UK ( Hopefully ). What to do with the month ahead ? The idea of Home Tasks whilst the sun shines is low on the agenda as is sitting in front of the computer preparing for the autumn season ahead. Nothing else for it then time to go climbing. Where and what is the next question. 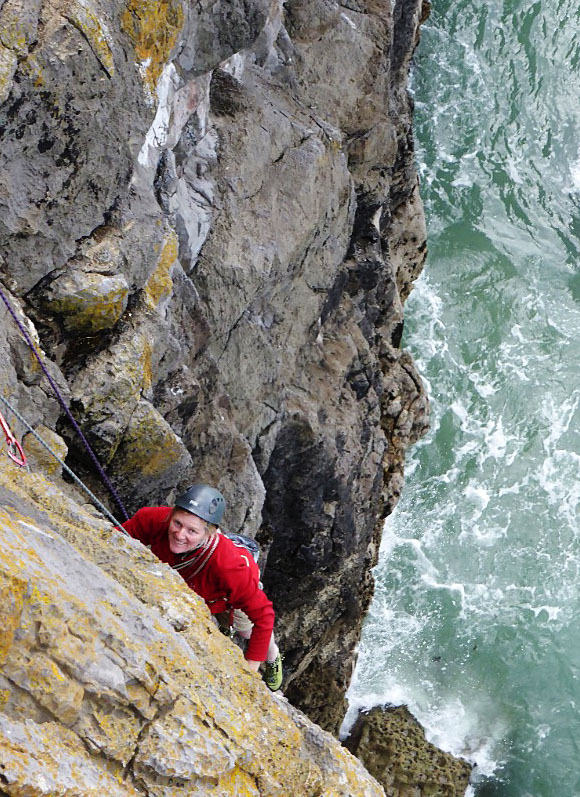 Clipping bolts is a winter pastime in sunnier climes so its time for some adventure and trad. That was it then, next question is where. Living in the South West we are truly spoilt for choice, so many venues however the best is found at Pembroke so 48 hectic hours after returning from Borneo, Choire and I fled to the sea cliffs of south Wales. Choire tops out at Mother Scareys. It was pretty short lived, I had kidded myself on as to my levels of fitness, Borneo had taken it out of me and three routes and 24 hours later I was exhausted. It was also extremely hot so we fled to Somerset. Someone ( climber) famous once said that if they could change the way they had lived their life they would have rested more, so with that in mind I took to the garden with a good book and a forceful attitude set around recuperation. I managed three days, which is actually really good for me, and demolished two really great books, then boredom getting the better of me Jane and I headed to Snowdonia for some cooler weather. Which is exactly what we got, four days of low cloud and drizzle, no climbing ( or at least one route on the Cromlech which we had to retreat from due to it running with water ) but lots of low visibility navigation whilst out for our daily promenade. However somewhat refreshed and rested we returned to the Tropical southwest to get back onto dry rock. A pleasant enough day at Shorncliffe in the shade of the trees and then an extremely hot afternoon at Bector wood followed by an ever hotter day at Avon new quarry with Mr “clean hand” Findlay who showed his displeasure at my use of a chalk bag. Executed for using a chalk bag ! I just canny do without one ! It was really too hot for climbing, the summer was turning into an increasingly long heat wave. However a couple of friends from Scotland ( Rab and Gav ) were heading down to join Jane and I for a long w/end at Pembroke, so thats where we went. First day was actually a bitty wet and poor Gav got caught on an horrendous route in a heavy rain storm, which if I had not been belaying and forced to stand under an overhang that turned into a shower might have been quite amusing ( for me). It was however a great opportunity for me to have a rest. Climbing with Jane and Choire and being the more experienced climber I tend to end up doing most of the leading. Gav ( the famous mountaineer ) Swinton was keen so I let him lead the majority of the routes and revelled in the stress free pastime of seconding and leading the occasional easier pitch. Climbing with Gav and Rab also forced me to go to places that I would usually avoid, either because they are too busy ( especially on a bank holiday), I have been there many times before and have done most of the routes in my grade range or I just didn’t fancy it. 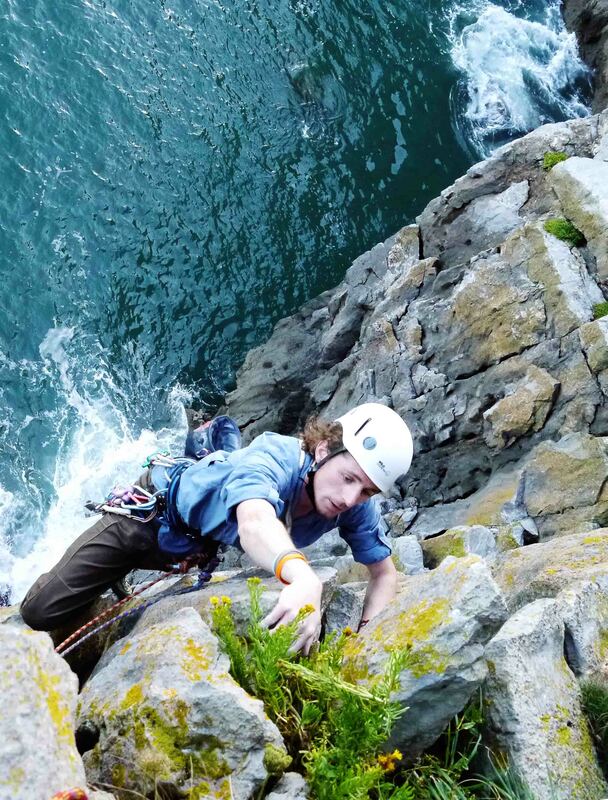 So we visited Mowing word ( where Sealhunt scared me silly) but Rab really enjoyed Diedre Sud one of the Pembrokeshire classics and Gav and I did an excellent HVS (High in the grade) called Snozwanger. 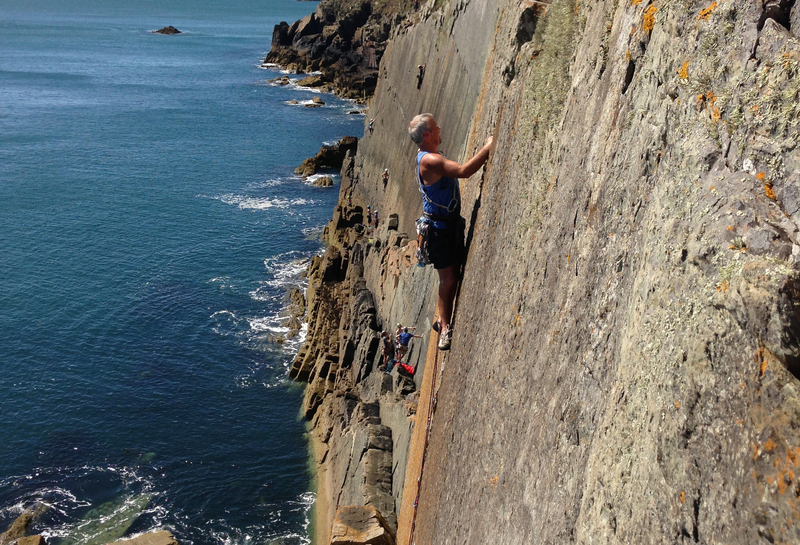 We then went to Carreg y Barcud to play on the fingery slabs, a completely different style of climbing from the majority of other stuff in Pembroke. The crag was heaving in the bank holiday sunshine and we had to pick and choose our routes accordingly, however Gav led the classic Sinecure, chasing another party up the route and Rab the classic Yellow Edge. 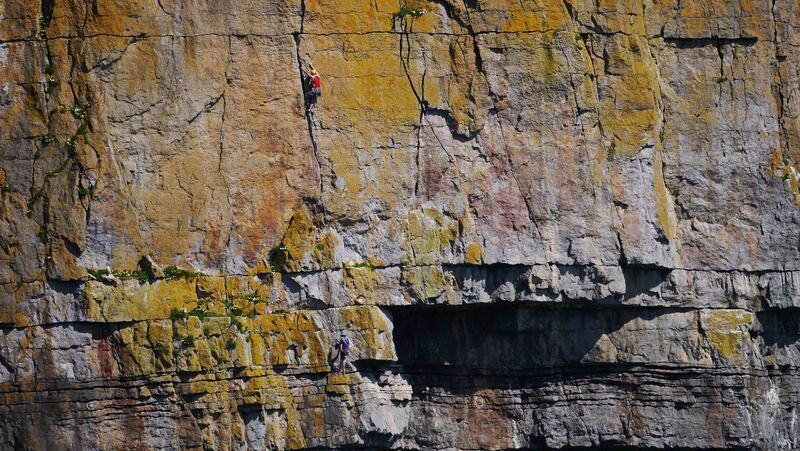 Pembroke for me remains the best place to climb in the UK, a range of different climbing styles. Adventure climbing still abounds there with lots of new stuff to go at ( if thats your bag ) or just lots of uber classics at all the grades in both single and multi pitches. However now its time to get my head back into work mode as the Autumn expedition season starts, which by the time it finishes will see us into winter. Rested and relaxed ? Climbing with the Stars May 2013. Driving down into Cheddar Gorge at the start of the month we found the road constrained by a set of temp traffic lights. We waited and as our turn came to pass the obstruction we were amazed to find it caused by a film crew and ( Teddy ) Bear Grylls. Choire on Touch the Fire E2 5C at Shorncliffe. This made me think about the whole celebrity mountaineering thing, I guess there are three main types here. 1. Those who really do the business and do not use it in any way to seek media attention, the unsung heros of the sport. 2. Those who really do the business and use it to make a living through marketing the image. 3. Those who pretend and sell a lie. 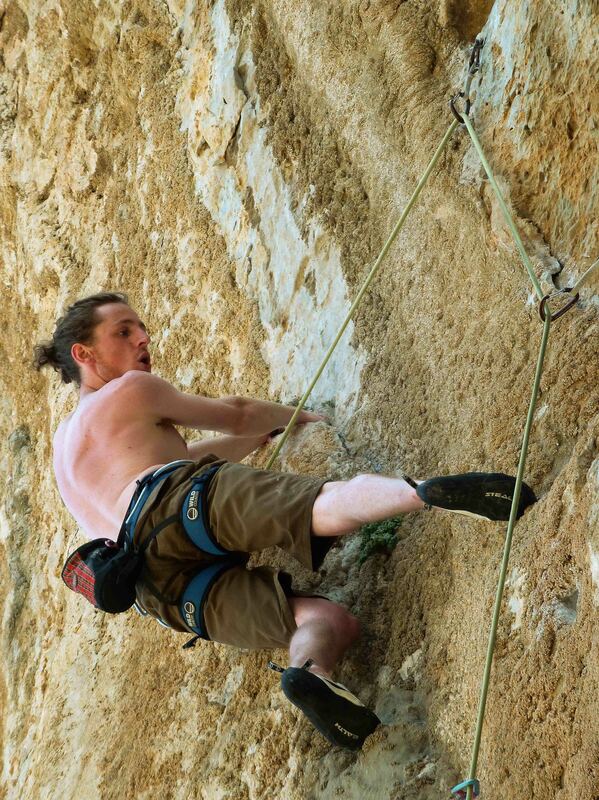 I will let you make your own mind up about Teddy and which simplistic bracket he fits into but in my mind and in the climbing world “no-one likes a bullshitter”. Aye you will always have tall stories told after a few beers about the epics on the crags but this is greatly removed from the pretence of doing something you did not and cannot. However we were there to climb and that is what we did with an ascent of a good VS and an E1 called Dinner Date which are both trad routes up on one of the higher buttresses in the Gorge. I was really surprised at just how vegetated the route was, clearly it had not been climbed in a while, is this a result of the bolt routes being more popular now or just that it is a bigger walk in to get to it, dont know but its a great route. May has been a really great month for us getting out on the rock. Cheddar, Avon New Quarry to enjoy clipping some bolts and some big multi pitch routes down on Bristols “urban” crag. 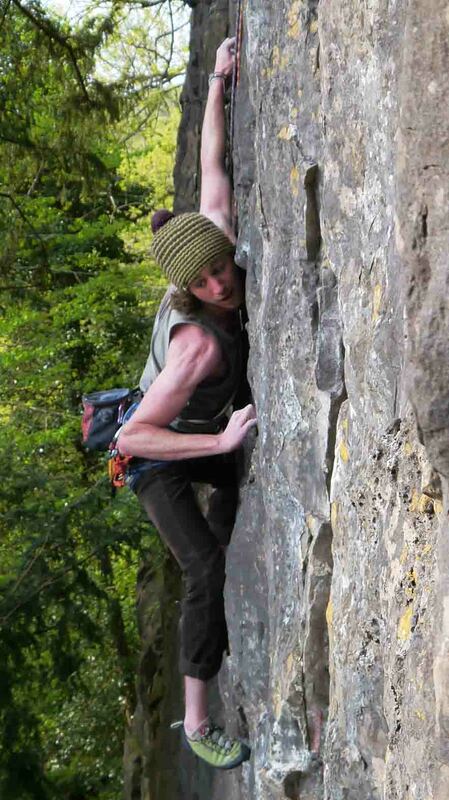 Bolt routes are quite good and well worth the effort, the big “easy”multi pitch routes are a nightmare of polish. A day out at Shorncliffe in the Wye valley where we ticked Emotional Dyslexia, Organ Grinder and Touch the Fire. However, again I was quite surprised at just how overgrown the approach path was and how vegetated ED was. We were the only people there and it was a lovely sunny day. The month culminated with an unplanned visit to Pembroke. The weather was set to be great so we upped and offed over to the CC hut in Maiden Wells. Sat morn saw us down at Stennis head waiting for the tide to receed at St Govans where we ticked Manzuko and a wee VS called Highland fling. Then it was over to St Govan’s where I had a bit of a ghost to exorcise. Two years ago I fell off of Deranged and every time I have gone back to “do it” have always found a reason not to, too greasy, not in the mood, too hot and sunny, didn’t sleep well last night blah blah blah. Truth is I was just plain scared of it. However not this time, it did scare me silly but it got sent and I felt really good for it. Choire then got on an HVS called frontline to finish what had been an excellent day off. Next morning Henry, aka Noggin joined us along with Tom Rodgers for some more stuff down at St Govans. Hangover 77 E1 5B, Zero Hour HVS 5B, Ricochet E2 5C, The Arrow E1 5B, Flanker HVS 5a and the Kraken E2 5B. The Arrow was Choire’s first E1 lead at Pembroke and what a classic to tick, he not only cruised it but took the roof direct at the top just to show that he was not phased by any of it at all. Henry ( Noggin ) did battle with the Kraken, a route which normally sulks in the gloomy west facing corner but was, by the time he got around to it, bathed in the wonderful late afternoon sun giving me a great photo opportunity. Weary and just a tad broken we elected not to face the drive home that night but to stay another day and beat ourselves up some more. St Govans was, it being a week day, out of reach. It is a military firing range and is closed most week days. why this should be beats me. The Pembrokeshire coast line is one of the most beautiful coast lines in the South of the UK, it should be a major tourist attraction, it is a world heritage site yet they close it off for the best part of the year so that soldiers can fire guns. There must be some place just a bit more appropriate for this to happen. Anyway we went over to Mowing Ward where we were able to climb to the sound of small arms fire drifting over to us from St Govs above the calls of the gulls and the Kittywakes. Choire and Tom set off to do battle with Heart of Darkness a Pembrokeshire classic, Henry and his mate Brett went off Sealhunting ( Its the name of a route, they didnt have clubs with them ) while Jane and I elected to abb down and do Dierdre Sud one of the pembroke Top 50 routes ( as advised by Rockfax ). The real stars of this month were the Pembrokeshire routes, in fact nearly all of the routes we did were three star ones. This place is still, in my humble, one of the best trad crags in the world, big boast I know but the routes are just brilliant. However now I need a rest, I ache all over. Carpe Diem. Kalymnos April/May 2013. Choire prepares to lunge for a good pocket way past the last clip. I read somewhere recently that Carpe Diem, long associated with youth and their “just going for it” should no longer be attributed to this age group any more. Rather it should now be the motto of the 50 plus age group. The rationale behind this being that the over 50’s have to make the most of the active time they have left, whereas the young have enough time left to perhaps, just take it a bit easier. Now there’s another paradigm shift in attitude for you, but if this is the case then it was fairly evidently being followed in Kalymnos just past. Last time we were there I made comment on the change in the gender balance now climbing, see Climbing 2012, this time there were undoubtedly far more climbers over 40 than those in their 20’s. Brilliant, long may it continue, for my sake if for no one else’s. Gritting teeth on a 7A at Summertime. Arriving in Pothia, after Easy jet ( Bloody awful service at Gatwick 2 checkin desks open for 200 customers ) had deposited us in Kos and we had taxied it ( no need fror seatbelt sir I drive fast and safe ( oxymoron at its best)) and then ferried it to Kalymnos, we were reminded that not only is Kalymnos a great climbing venue, it is a world class sport climbing venue. Highest profile point of the main harbour is given over to a huge banner proclaiming the North Face climbing festival being held there, again, in October this year. 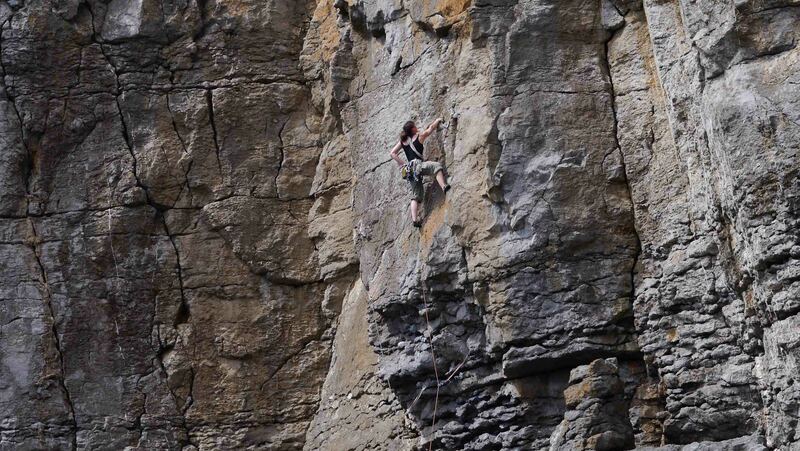 March, April/May and Sept through to Oct the Island belongs to climbers of all ages and nationalities. This does not mean that climbing stops at other times but it can be a bit hot in the summer months and sometimes a wee bitty wet in Jan/Feb. However we were there to sample the delights that the islands many limestone crags had to offer, and once again we were not disappointed. Out of the 15 days that we had on the island we climbed for 12 of them, ticked over 50 different routes and never visited the same crag twice. The sun shone every day, we never saw a cloud, the only complaint that could be possibly made is that it was just a wee bit too hot for climbing in the sun. No problem, get up early ( 0600 ), climb in the shade and then go for a swim in the afternoon. where a whole new sector is now open, Lambda, some 20mins walking uphill from Irox. 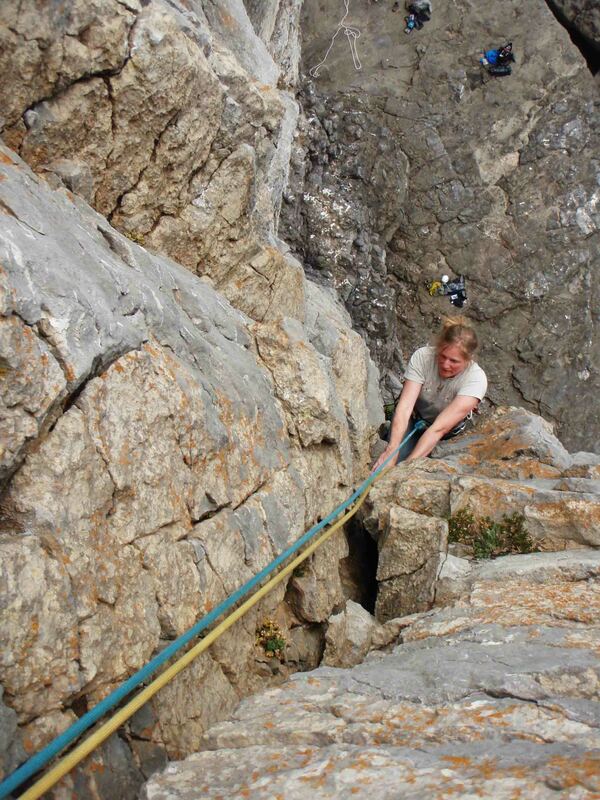 Its a great sector but you need a 100m rope to get the best of it as many of the routes are either 40 or 50m long. 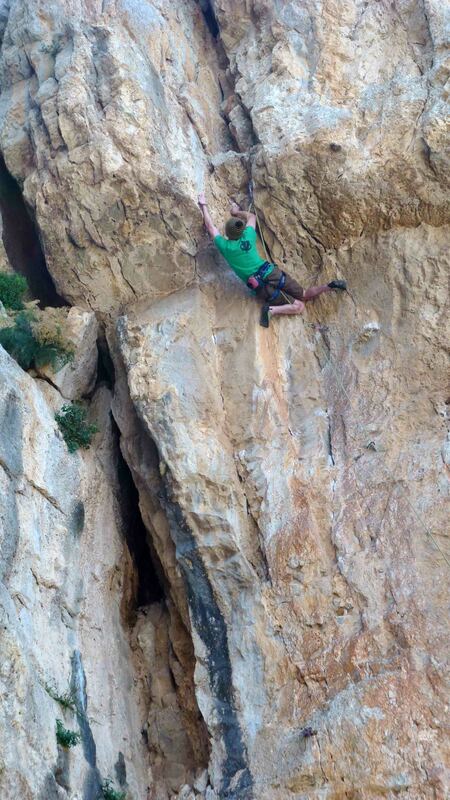 We also visited Iannis, Spartan wall and Summertime, which are all crags I had not been to before. Summertime is OK, gets the afternoon shade, generally quite low grades with a couple of nice 7’s. Spartan wall was a bit greasy ( and busy) in the humidity the day we went there but do not miss Lucifers Hammer a brilliant 6c if you go. Iannis is a great crag with a small range of 6’s through to 8’s. On one of our rest days we walked out to Sikati cave on the north of the island, glad it was a rest day, the routes there are just way out of my league. It is however well worth a visit just to look at from its geological perspective. Equally of interest to us was the beautiful beach some 10 mins walk from the cave. Totally isolated, sheltered from any wind, breeze or heavy seas, a perfect spot to just forget about the rest of the world. The weekend of the 4th and 5th May was given over to the Greek Easter, the locals take part in a big religious procession through the streets of Pothia and then relax by throwing sticks of dynamite around, no Joke. The resulting shockwaves reverberating around the crags might just help to dislodge any loose rocks, or shake them up a bit. 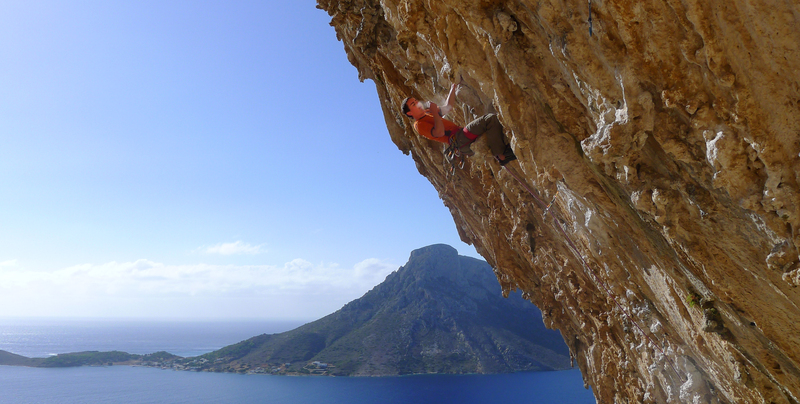 Every time I visit Kalymnos I like it more and more, the people are so friendly, the climbing is just awesome and its just such a great place to relax. Going back ? Of course, but with a 100m rope next time. D’art o Trad 19th April 2013. 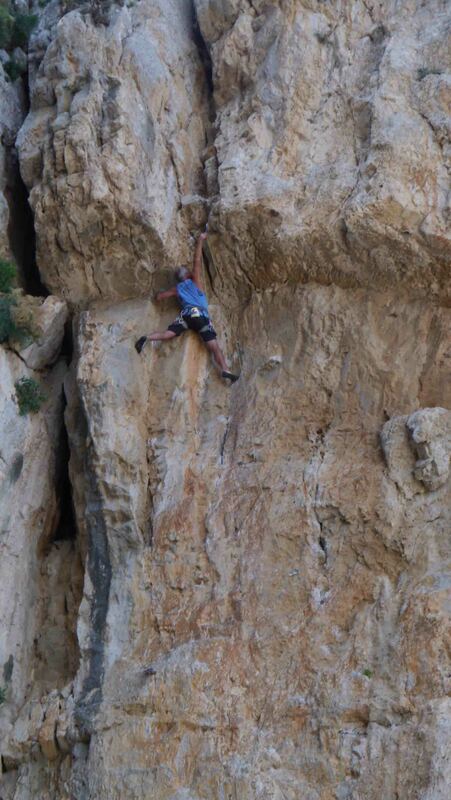 Sport climbing, Ice climbing, bouldering, DWS, Single pitch, Multi pitch, soloing etc etc etc. 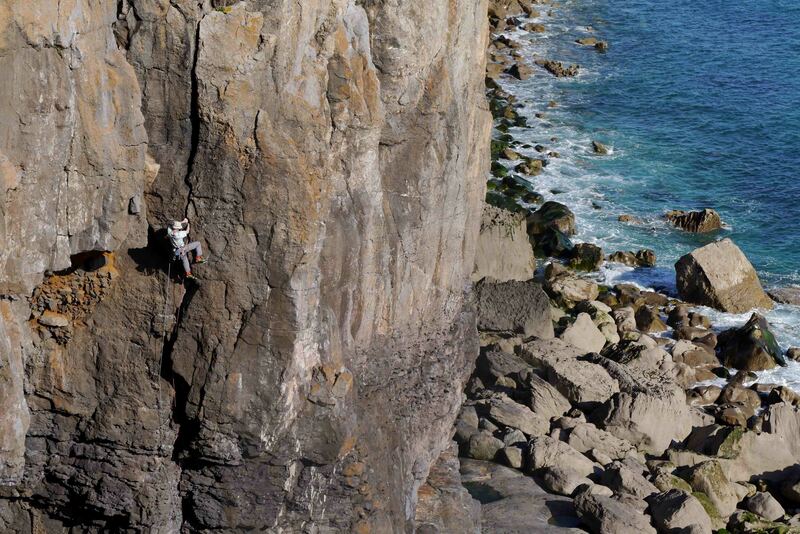 There are so many disciplines of climbing that it not surprising that some folk are just plain confused by it all. Compounded by the fact that they all have an independent grading system and even as a bit of a vet now I do not profess to fully understand them all. 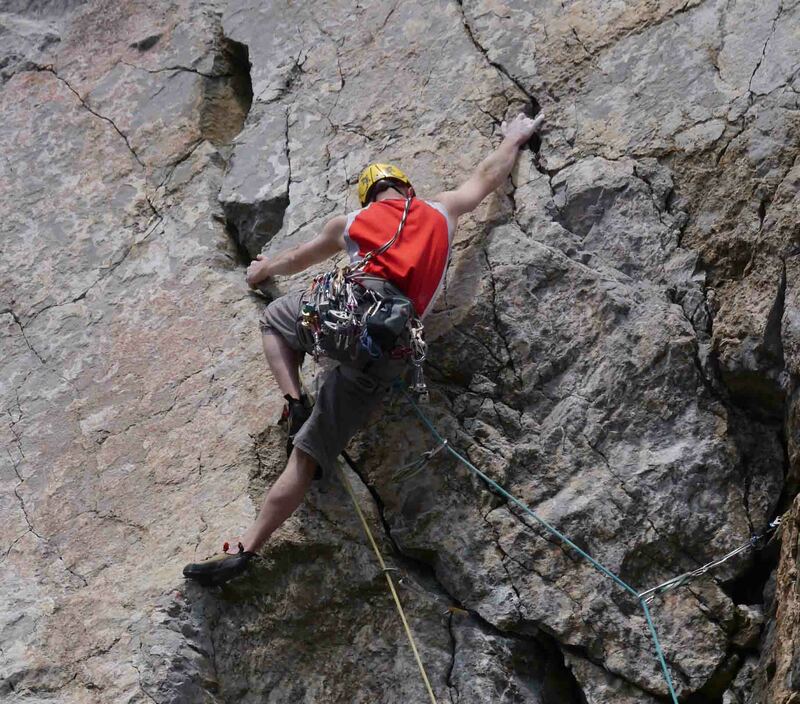 However traditional climbing is in fact just that, its the original discipline where you go to a bit of rock and climb it ( generally) without the aid of any pre-placed protection. You jam nuts and expanding thingies into cracks in the rock as you go to stop you from falling too far and hitting the ground. In my humble this is the most satisfying type of climbing as you have to trust your ability to place the protection whilst you are climbing and the risk and the fear factor, and thereby the satisfaction of a clean ascent, is so much greater. As our first trad venture of the year Choire and I headed down to Avon Gorge and onto suspension bridge buttress to bash out a couple of routes. Suspension bridge arete and suspense, two classic HVS’s of the cliff. The plan was to ramp it up and get onto some E1’s but rain half way up the second of the routes dampened my enthusiasm for more. A nice introduction to (hopefully) a good traditional year ahead. Back on the rock, at long last. 2013 has been a slowwww starter, the sustained arctic blasts of an adjusted jet stream meant that the conditions were just much better for getting out with the axes and crampons than with the chalk bag and draws. A longer than expected winter season in the climbing wall however had meant an improvement in fitness. It had to come to an end sometime however, otherwise I would be pulling the holds off the rock with my climbing wall fingers. Then, all of a sudden, and as usual, the sun came out and the temperature went up. ( well not really but 16 degrees after -10 felt warm ). Choire and I were totally up for some steep crimpy limestone and decided to start as we meant to continue with a warm up on Pregnant Pause, the biggest arete on the island. Its a good but a scary 6a+, you have to be comfortable with exposure on this one as at just over third height the route climbs the arete proper and gives a feeling of immense exposure. There has been a rockfall on the route and there is now a big loose block on it which is gonna cream someone’s belayer if they pull it off.. BEWARE. 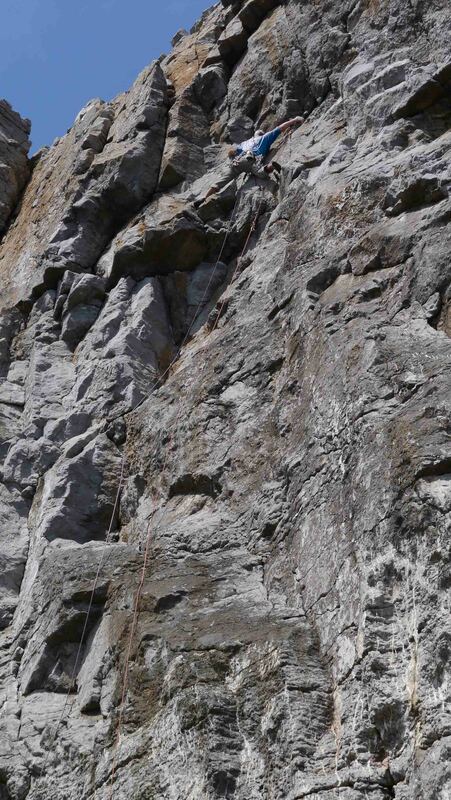 We then moved onto a 6C called the long walk which for some reason is given no stars in the guide, however do not miss it, its a great route, bit of a cheesy start but once on the steep rock its nice sustained technical climbing with a steep overhanging finish. After that we ticked a 6b+ called skank central which despite the name was worth the effort and then finished our first day back on the rock by sending burning skies, a classic 6C of the area. 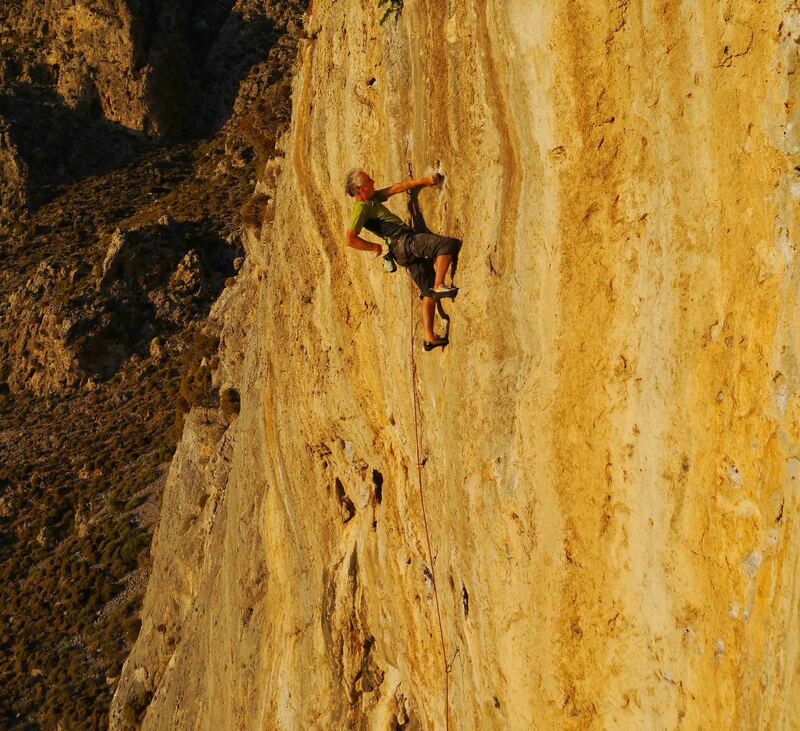 As we are heading out to Kalymnos at the end of April we decided to stick with the sport climbing ethos and over the next few days headed to a local quarry called Bector Wood. We were then able to establish what the grades of the various routes were but I am afraid I cant remember their names. So if you are heading out there there is a big sweep of slightly overhanging rock on the left of the quarry with 6 or so routes from 6c to 7b+ which are well worth the doing ( or so I am told for the 7b+ ). Prior to this sector there are a mix of 5’s and 6’s on some broken rock, some of which are a bit dubiously bolted but are worth while none the less. We have now been back twice and have had reasonable sport there but I guess there is not much more to keep us going there more than a couple of more times. 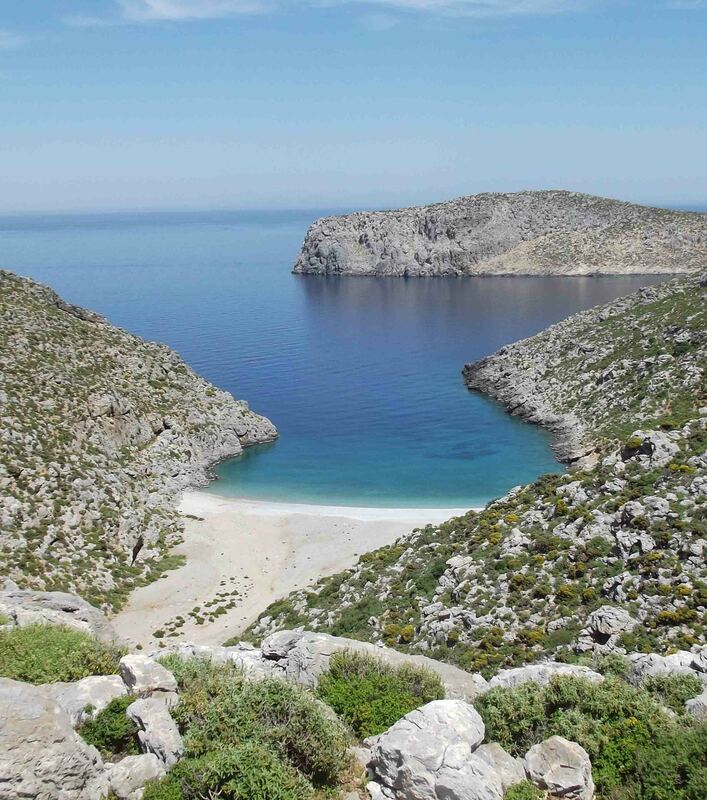 However we only have a week left till we go to Kalymnos, I cannot wait.